Want more patients to find you online? The result is that without a proven medical PPC (Pay-Per-Click) advertising strategy, you could be knocked out of the game. New patients who used to find your practice listed on the first page of search results may now see your competitors listed well above you, thanks to their PPC ad. Higher listings mean more phone calls are going to their practice instead of yours. In the past few months, Google, Bing and other search engines that your potential patients are using to find you have made huge algorithm changes—changes in that “recipe” they use to rank results when someone types in a search query to find an medical practice in your town. The search engines decided that it would be really great for them if they could make more money on these searches. So they’ve moved the PPC ads from the right side of the search list to the top of the search list. Yes, the first search results you see when you type in a query are Pay-Per-Click (PPC) ads, not organic search results. You simply can’t put off medical pay per click advertising any longer if you want to schedule new patients. Any practice that invests intelligently in medical PPC is going to grab qualified click-through patients before practices who don’t. Those first 4 spots are prime real estate. The latest research shows that the first three search results on the page (paid or organic) net over half of the click-through rates. Everything below that pales in comparison. So if you’re just relying on organic SEO alone (which you still need in your mix), it’s no wonder new patients aren’t finding you! PPC for doctors is a lot more complicated now. The game has changed. MedPB™ can help your practice change with it. It’s been coming on for years, but this year is going to see a dizzying rise in precise audience targeting for any type of medical practice PPC or online advertising in general. Knowing your target audience on a granular demographic level (things like age, gender, income, the device the person is using to search from and even deeper metrics) will matter more than ever. Because search engines are constantly trying to fine-tune their search results so they are the most relevant to the user. 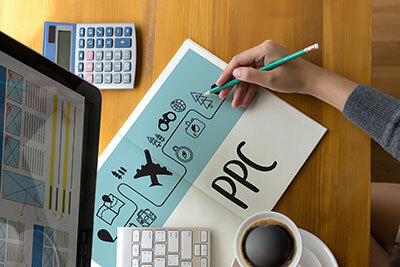 At MedPB™, our medical PPC techniques are constantly adapting to get deeper insight into targeting PPC ads to exactly those people who are most likely to click on your ad and schedule appointments with you. Remember how we mentioned that one of the audience-targeting metrics we use for your PPC ads is what type of device your target patient is using? Over 60% (and growing) of search queries come from mobile devices. Not only is this a major audience demographic indicator, but Google and other search engines boost the rankings for medical practice online advertising that is mobile friendly—in fact, they penalize websites that aren’t mobile friendly in search results. By mobile-friendly websites, we mean websites that load quickly and work well from your patients’ mobile devices. If your website doesn’t, chances are, even if they clicked on your PPC ad, that patient will go to another practice’s website that loads faster! Whether you think it’s insidious or ingenious, eventually your target patients won’t even realize they’re clicking on ads when they click on them. They’ll look like “news stories” or interesting articles with fascinating titles (within their highly-targeted demographic). You see PPC ads like this all the time after you’ve read an article in a major news outlet; there will be “Other stories you might be interested in” at the bottom… more than likely, those are ads. PPC for doctors has to make use of these native ad strategies to target the people most likely to schedule appointments. Here’s one thing you can take to the bank: search engines are going to keep updating their algorithms forever. They will keep trying to fine tune how accurately they can deliver the search results most relevant to those using their search engines. The same goes for the PPC ads they show people. Even the most clever medical practice marketing can get lost in the continuing changes the search engines are making to how they present results to searchers—your potential patients. The patients you want to find you on Google or Bing may never see you if you don’t stay on top of these regular changes. You will absolutely need a medical PPC management team on your side who can stay on top of these algorithm changes so that you can focus on doing what you do best—taking care of your patients with the highest quality care you can provide. You also need your advertising dollars to go as far as possible to bring you new patients! MedPB™ has an incredible track record of making that happen. We understand the intricacies of PPC for doctors specifically. We constantly adjust your campaigns to ensure they bring in the most qualified (ready to make an appointment) patients. Are you ready for more new patients? Talk to us today about the fastest way to get booked solid. What’s Wrong With Being #1 On Google?